Of course it is important to do things that don’t scale to test your hypothesis. Therefore it is good to test if a nudge will move people and what else you could do to get people moving. This is very event driven, how to get people to do X. However at a moment in time you need to think on how to move beyond this non scalable approach and scale up rapidly. Non scalable efforts often cannot be sustained on the long term. Non scalable activities are heavy lifting, or can be heavy lifting when there are a lot of these activities. The challenge is how to have the same or better results without that heavy lifting. One thing I do is by switching the goal focus. Non scalable activities are often very event driven, do X to achieve Y, where X and Y have a one on one match, or a two on one match (twice the X to achieve one Y). However what you would like to achieve is to minimise you interactions to still achieve the same outcome. To do so often you have to focus on a behavioural goal and less on a event driven goal. Since if you can start changing behaviour from people to do Y, it will require less activities from your end to make them do Y over time. Which means that the heavy lifting will disappear for a certain group of people and the attention can be on a smaller group of people who have a harder time to make this change. Imagine you want your employees to create content whether these are tweets, LinkedIn updates or blog posts doesn’t really matter. If your goal is to make sure every employee creates X amount of messages in Y period of time, you are very event focused. Which means you will work to achieve X in period Y. If you want to repeat this a second time, you still have to invest the same amount of time to get your employees moving the needle in the same direction. Basically you are just hopping from time period to time period and probably have a feeling it is a Groundhog Day. But if you change your goal to enable your employees to create X amount of messages every week, you are very behaviour focused. There is no end to this period and you want your employees to make the number of messages they produce into a habit. Something they do over and again. So instead of pushing for a number in a limited period, you are approaching this as a longer term project to change the behaviour. Which most likely implies that you have to invest more time upfront (since you have to learn people how to do X time and time again) while you will have to invest less over time since the employees will be available to repeat their learned behaviour time over time without your involvement. 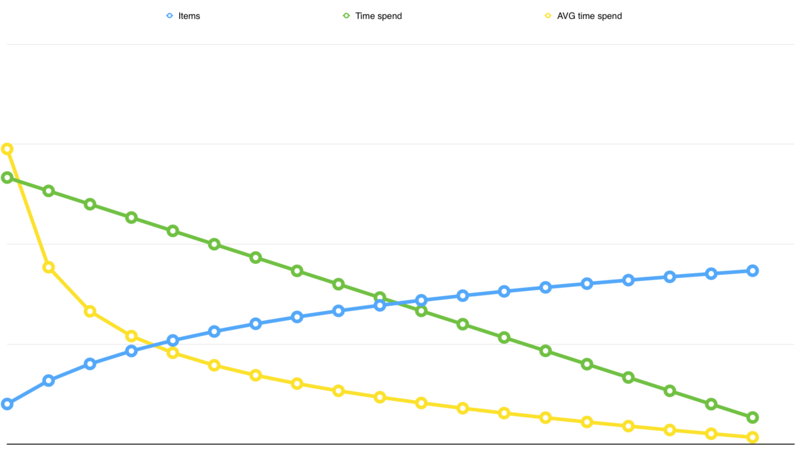 Clearly average time spend per item / action stays the same over time. Which means if you want to get twice the results, you have to invest twice the time. The average time you have to spend per item will decline over time. Since people change their behaviour you don’t have to invest the same amount of time over and over again, which means a more scalable solution. 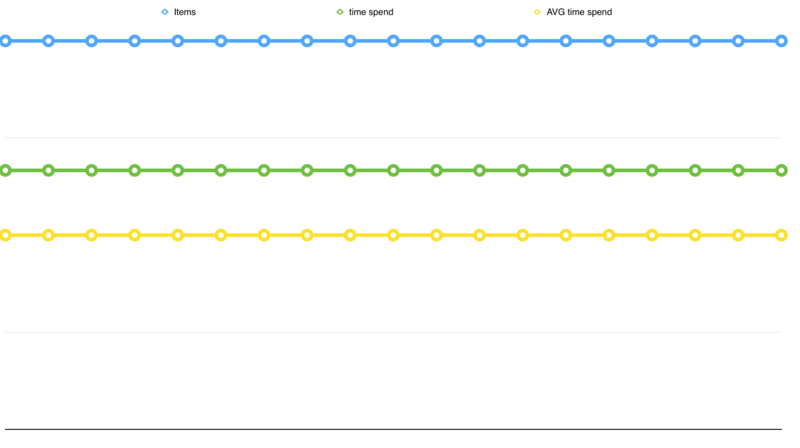 The graphs show that if you want to be busy: just focus on event driven goals. You have to invest the same amount of time over and over again to get people moving. So if your goal is to build up head count or to create the perception you are indispensable for doing this, just focus on events. You will get the results you want, and you still have to do the heavy lifting, it is like being a worker at the conveyor belt, doing the same trick every few minutes. Until of course a robot arrives taking your job…. If you want to move forward you cannot expect yourself to do the same thing over and over again and have to hire more people if you want to do more. You want to get things moving without your direct involvement, you want things to scale and preferably only focus on the more difficult situations in which you can really add value by getting people moving. Of course it might be clear that there is moment that everybody (or enough people) is moving, which means that you can move on to the next challenge to solve. Thanks to Rena Patel for proof reading this piece first :).